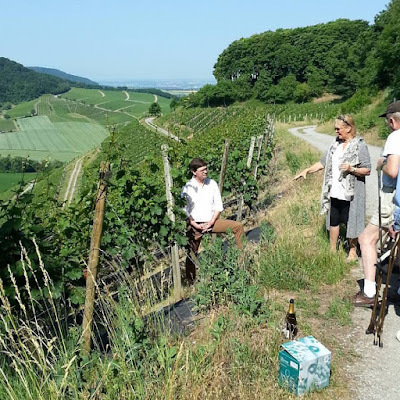 The visit of the Weingut Fürstlich Castell’sches Domänenamt in Castell, Franken, started with a vineyard tour, where we had a glass of a Weingut Fürstlich Castell’sches Domänenamt Sekt. We then toured the winemaking facilites, including the old wine cellar. We finished the tour with a tasting of Weingut Fürstlich Castell’sches Domänenamt wines. General Manager and Winemaker Björn Probst hosted us. The Weingut Fürstlich Castell’sches Domänenamt is one of the oldest wine estates in Germany. 70 hectares of vines in seven vineyard sites – nearly all in sole ownership – form the core of the estate. The first mention of the vineyards Schlossberg, Hohnart, Reitsteig, and Trautberg is found in a document from 1266. The vineyards are all situated below the family’s ancestral home and are marked by the powerful gypsum marl soils of the Steigerwald’s slopes. Over 40 percent of the vineyards are planted with Silvaner. The Castell family was instrumental in introducing the Silvaner grape – originally from an area that is now Slovenia – to Franken in 1659. The House of Castell is a German noble family of mediatised counts of the old Holy Roman Empire. The origins of the Castell family can be traced back to the year 1057. The Castell family was an influential force and reigned over a number of well-known places in Franconia. There are 2 lines, the Castell-Castell and Castell-Rüdenhausen family branches. Faber-Castell is a sub-line of the Castell-Rüdenhausen branch. Through the marriage of Count Alexander of Castell-Rüdenhausen (1866–1928) with Ottilie Baroness von Faber from a well-known family of industrialists the branch of Faber-Castell was created in 1898. Major components of the assets of the Castell family include: (1) Fürstlich Castell’sche Bank, Credit-Casse AG. This private bank was founded in 1774. It is the oldest private bank of Bayern. (2) Weingut Fürstlich Castell’sches Domänenamt. (3) A.W Faber-Castell – one of the world's largest manufacturers of pens, pencils, office and art supplies, as well as high-end writing instruments and luxury leather goods. The Faber-Castell company was founded in 1761 in Stein near Nürnberg by cabinet maker Kaspar Faber (1730–84), and has remained in the Faber family for eight generations. It opened branches in New York (1849), London (1851), Paris (1855), and expanded to Vienna (1872) and St. Petersburg (1874). It opened a factory in Geroldsgrün and expanded internationally and launched new products under Kaspar Faber's ambitious great-grandson, Lothar (1817–96). In 1900, after the marriage of Lothar's granddaughter with a cadet of the Counts of Castell, the enterprise took the name of Faber-Castell. Björn Probst has been Managing Director and Winemaker since 2016. Before joining the Weingut Fürstlich Castell’sches Domänenamt(42), he was running the Weingut zu Weimar and the Weinhaus zu Weimar in Sachsen, owned by Prinz zur Lippe. Born in Cologne, he studied at the Geisenheim University. The ‘Schloss Castell’ line is made from Franconian grape varieties presented in the traditional Bocksbeutel: accentuated by fine violet or herbal aromatics, with a balanced note of minerals or fruit - always distinguishably Franconian. Schlossberg is the top Castell vineyard. 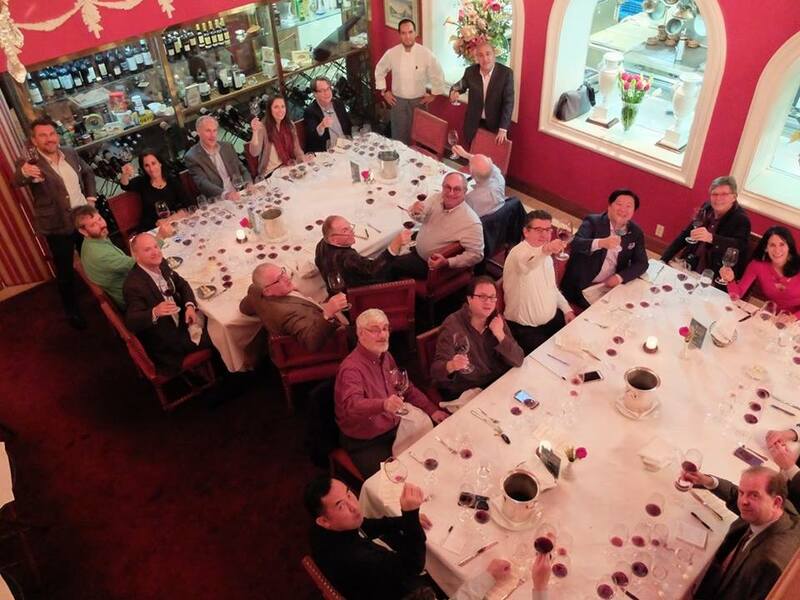 The vertical tastings with Bordeaux star producers organized by Panos Kakaviatos in Washington DC are legendary. This time, he managed to arrange a 16 vintages vertical with General Manager/ Winemaker Nicolas Glumineau of Château Pichon Longueville Comtesse de Lalandeat at the excellent Spanish restaurant La Taberna del Alabarder. Nicolas opened 2 bottles for 24 Bordeaux lovers, including Tim O’Rourke of Zachys Wine, Marc Wessels of MacArthur Beverages, Washington Post wine writer Dave McIntyre, blogger Nix-Gomez, Lisa Denning, staff writer of the Grape Collective, who traveled all the way from New York City to participate in the dinner, and wine writer Bijan Jabbari, who helped organize the event. Dear Friends, I know that I usually organize such events in January - and that should happen, too, in 2018 - but we have the good fortune to welcome Nicolas Glumineau of Château Pichon Longueville Comtesse de Lalande to Washington D.C. on Wednesday evening 18 October this year. 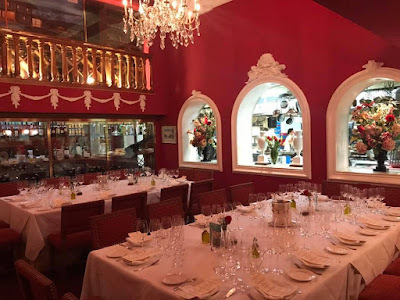 Two bottles each of 16 vintages are being shipped over, ex-château, to Washington, for us to enjoy over a full course dinner at the excellent Spanish restaurant La Taberna del Alabardero. Many thanks to Bijan for helping to locate this establishment, since Ripple has sadly closed. Because we should be 24 people, restaurant management has kindly agreed to close off a large space of the restaurant for us, so we would not dine in the cozy single room for smaller wine dinners. The food is excellent there and so should be the service. 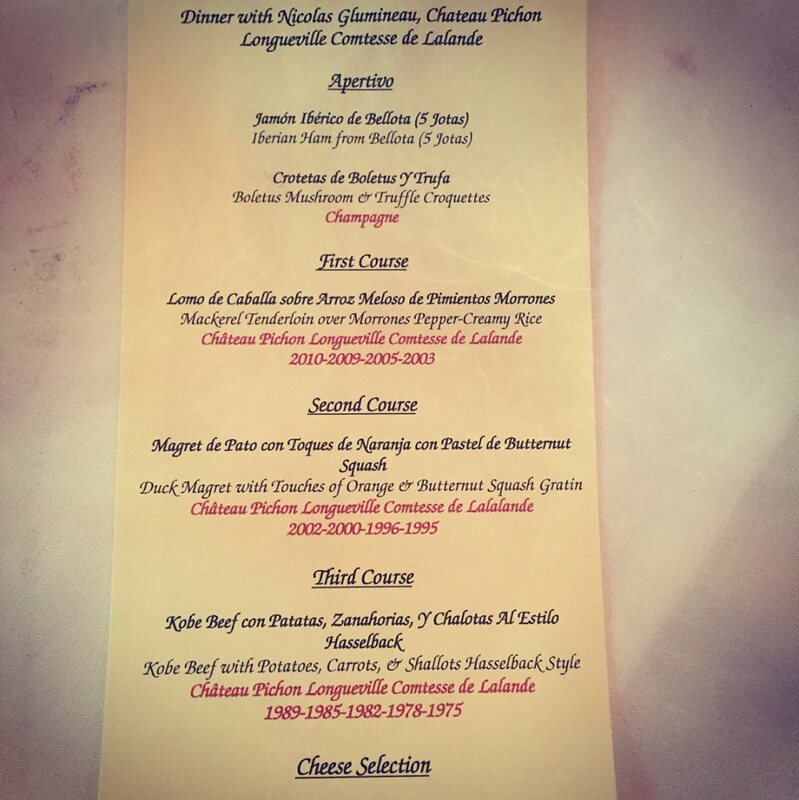 Will have more details on the dinner servings, as the menu is being planned. But the dinner, including tips and taxes, comes to $200 per person, including the 16 vintages of Pichon Longueville Comtesse de Lalande. Please let me know if you cannot make this, as we do have a waiting list. Château Pichon-Longueville Comtesse de Lalande is one of the so called Super Seconds. It is a 75-hectare property that produces on average 36,000 cases per year. Located in the east of the Pauillac appellation, the vineyards lie on deep gravel beds underpinned by clay and then sandstone and limestone (part of these vineyards actually reside in the St-Julien appellation). The wine is fermented in stainless steel cuvées and then matured in oak barriques (50% new) for 18 months. With 45% Cabernet Sauvignon, 35% Merlot, 12% Cabernet Franc and 8% Petit Verdot, Pichon Lalande has an unusually high proportion of Merlot for a Pauillac property, which tends to make the tannic structure of this wine slightly softer than wines from many other classified Pauillac châteaux, which particularly in France is described as a more "feminine" style. In recent years, however, Pichon Lalande has moved to increase their plantings of Cabernet Sauvignon, with the belief that Cabernet is fundamentally better suited to the portion of the château’s soils that are on gravel. Château Pichon-Longueville Comtesse de Lalande was once part of the larger Pichon estate, owned by Pierre de Rauzan, along with what today is Château Pichon-Longueville Baron. In 1850, the estate was divided into the two current Pichon estates. In 1925, Château Pichon Longueville Comtesse de Lalande was bought by Edouard Miailhe and Louis Miailhe. The daughter of Edouard Miailhe, May Eliane de Lencquesaing (born in 1926) later became the owner and manager of the property. In 2006, May Eliane de Lencquesaing sold a majority interest in the château to the Rouzaud family, which also owns the Champagne House Louis Roederer. A totally new cellar outfitted with modern equipent was in place for the 2013 harvest. The second wine is called Réserve de la Comtesse. Nicolas Glumineau has been Managing Director and Technical Director/ Winemaker of Château Pichon Longueville Comtesse de Lalandeat since 2012. His first vintage at Pichon Lalande from start to finish was 2013. Nicolas Glumineau: I have always loved wine, but it was not my first career choice. I studied biological science an d research, but I realized early on that I needed to be outside – a laboratory or a research desk was not the environment in which I would be happy. Around that time, I came to the Bordeaux region and ended up meeting my future wife. My plan was to become an opera singer, but the amount of travelling was too much to maintain a good relationship. 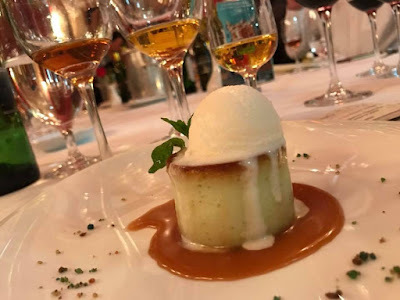 So, what could be more obvious than combining my love for wine and the fact that I live in the most prestigious region for wine – Bordeaux – with my profession and start a career in the wine business? 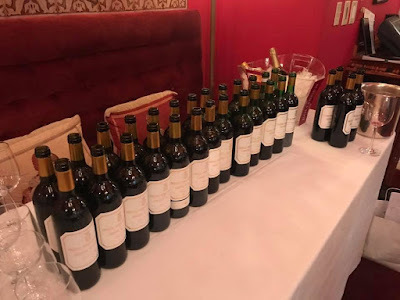 In 2005, I worked for Haut Brion and in 2006 for Château Montrose before I became the general manager of Château Pichon Longueville Comtesse de Lalande. I look back at my career and think it was the best decision of my life to work for the wine business. The evening began with Champagnes generously donated by participants, including fine grower bubblies, such as a delicious La Closerie by Jerome Prévost, an Extra Brut Agrapart Terroirs both savory and sleek, a lovely Pierre Peters Blanc de Blancs, and a wonderful Domaine Cedric Bouchard among others. There were larger houses, too, including a brisk and refreshingly dry Pol Roger 2008. Mackerel Tenderloin over Morrones pepper-creamy rice. When times call for unapologetic, old-world formality, reserve a table at Taberna del Albardero. Regal and resplendent, with everything from the walls and fabrics to the plush carpets awash in vivid red, this is the kind of place where servers donning formal attire deliver white glove service to international dignitaries-the din of a dozen different languages weaving a kind of symphony in the background. Madrid-native Javier Romero's menu begins with classic Spanish tapas-patatas bravas and gambas al ajillo. Edgier creations may include prawn burgers on ink-tinted buns and arroz cremosa calabaza, a Spanish riff on risotto with tempura-fried Blue Point oysters, butternut squash purée-flavored sauce, and a drizzle of anise liqueur. Javier Cuesta Muñoz is the Executive Chef. Wonderful start. Beautifully perfumed nose displaying intense sweet red and black fruit, cassis dominates, also cherry and blueberry, strong floral note, a hint of vanilla/oak, caramel, a hint of spearmint, only a slight hint of lead pencil, spicy, no noticeable PL signature green/vegetal note and limestone/earth. Excellent concentration, beautifully layered, rich and sweet yet precise and energetic, very silky and fluid, noticeable very fine tannins and a seamless long sweet red fruit and flower driven finish. Telltale sign of PL’s red fruit and precision. I believe lead pencil will emerge in time but not sure about the green/vegetal note. IMO, this may develop like the 89, i.e. good density and energy. This will please both the traditionalists and the modernists. One of my top wines. Expressive nose displaying mostly black fruit with a hint of plum, blackberry, cassis, strong PL bell pepper which is surprising considering the vintage, also strong PL/Pauillac lead pencil, coffee, a hint of burnt sugar lollipop and mineral. Very good concentration, not as polished/layered as the 10, ripe but linear, warm and soft in the middle, good acidity, fine tannins and a medium to long sweet black fruit/plum and green pepper/lead pencil driven finish. For my palate, showing strong PL bell pepper and lead pencil, i.e. seems more PL than the 10. I slightly prefer the 10’s energy, opulence and precision. I typically don’t point out the openness but the 10 seems more open than the 09 in this occasion. Surprisingly soft, mostly warm subtle red fruits, cherry, strawberry jam, a hint of cassis, cedar and lead pencil. Medium light weight which is really surprisingly for the vintage, warm and soft red fruit, slightly lean, not terribly layered, good freshness and purity, good acidity and mineral, and a medium soft red fruit and lead pencil driven finish. This may develop like the 75 and 81 which certainly is not a bad thing. For my palate however, it is a bit disappointing considering the vintage which produced so many great age worthy wines. Surprisingly classic, nicely masking most of the 03 roasted fruit expression, a hint of cassis and licorice, cherry, plum, grilled shiitake, cedar, bell pepper, a hint of eucalyptus, mocha, lactic and earth. Medium to fully body, silky but not terribly layered and a bit one dimensional, good acidity and mineral, and a medium to long black fruit and milk driven finish. I am surprised by the classic showing in lieu of the vintage. Not the most complex wine but really enjoyable. I believe it has reach the youthful peak but no need to hurry. Expressive nose displaying ripe blue and black fruit, cassis, dry blueberry, black cherry, licorice, a hint of lead pencil and bell pepper, and strong earthy mineral. Impressive concentration, sweet slightly dry black fruit driven palate impression, bright acidity, a hint of bitterness in the middle and a medium to long black fruit and bell pepper driven finish. Noticeable tannins at the end. Just like the other 02 top left bank wines, it displays impressive concentration and generous fruit but feels a bit “chunky”. Still very youthful and will improve for another decade or two, i.e. if you prefer the tertiary notes. Someone mentions the 00 Figeac but I actually like this wine as the wine is nicely balanced and show good density. The intense singular red fruit expression actually reminds me the 13 Ao Yun in a very good way. Expressive nose displaying intense sweet red fruit, strawberry concentrate, dry cherry, strong green note which is quite spicy so jalapeno rather than bell pepper/vegetal, kochujang (hot Korean pepper paste), lead pencil and limestone mineral. Very good concentration, nicely layered, good density, intense red fruit driven palate impression, bright acidity and a medium to long intense red fruit and jalapeno driven finish. Certainly showing noticeable PL green but the wine shows intense red fruit and excellent density for my palate. This will develop wonderfully for another decade. IMO, comparable to Clos Rougeard les poyeux/le bourg. If you like the style of PL, you will appreciate this wine. Very classic refine nose displaying singular black fruit, i.e. unison polished black fruit note, very floral and perfumed, cedar, strong lead pencil and crushed rock. Beautifully integrated sophisticate palate, silky and polished, cassis and lead pencil driven palate impression, very precise, perfect amount of acidity and mineral, silky tannins and a long mineral finish. I am a big fan of the 96, so classic, pure and energetic with impeccable balance. If you prefer the energy, sophistication and precision, this is totally ready. It is always fascinating to compare the 95 and 96 left bank wines. The 96 is the epitome of a classic claret, so sophisticated and precise where the 95 is opulent and hedonistic, always with a hint of roasted fruit, This is no exception. Expressive nose displaying sweet black fruit, cassis, blackberry, a hint of black cherry, coffee, mocha, cedar and mineral. Excellent concentration, good density, slightly rustic and chunk mocha/roasted fruit driven palate impression, bright acidity, good earthy mineral and a medium to long opulent sweet black fruit and mocha driven finish. Still quite youthful but ready to go. Really nice wine but I prefer the 96 for the purity, precision and polished palate. This is a textbook example of a fully mature classic claret. Fully mature harmonious nose displaying subtle red fruit, red currant, red cherry, cedar, a hint of caramel, lead pencil, leather and earth. Fully integrated palate, still remnants of tannins that remind us the vintage, harmonious and a seamless subtle finish. It would be a wonderful wine to enjoy in a cold winter night in front of a fireplace. The first nose impression is exotic Asian medicine, then generous sweet red fruit, red currant, cherry, caramel, PL’s signature bell pepper and lead pencil, leather, dry tobacco and cedar. More noticeable “materials” compare to the 75, still generous red fruit, decadent red fruit, nicely layered, medium acidity, good mineral presence and a long cedar and red fruit driven finish. There is a hint of Asian medicine at the end. The note of bell pepper and lead pencil is a telltale sign of Pichon Lalande. However, a strong note of Asian medicine makes this, perhaps the most exotic wine of the night. It has reached the peak will drinking beautifully for another decade or two. The 82 Pichon Lalande has been one of the most consistent 82s that seems to always flirts with perfection. It combines the hedonistic opulent fruit of the vintage with PL’s freshness and energy, i.e. bell pepper/lead pencil . Unfortunately the expression on this bottle is not so clear. All the components seem to be there but the impression is slightly murky. Medium expressive nose displaying decadent ripe red fruit with a hint of cassis, a hint of bell pepper and lead pencil, cedar, caramel and strong wet limestone like mineral. There is a hint of soy like oxidative note which is unusual. Excellent concentration, nicely layered, good acidity, nicely integrated tannins and a medium to long ripe black fruit, green pepper and cedar driven finish. Really enjoyable but not the best bottle I have had. Fully integrated nose displaying soft and round red and black fruit, cherry, strawberry water, a hint of cassis, cedar, dry leather, a hint of tobacco, lead pencil, bell pepper, and earthy mineral. Perhaps the silkiest and most polished palate, very precise, perhaps slightly lean, only a hint of red fruit, bright acidity and a medium to long seamless mineral and red fruit driven finish. Another classic Pichon Lalande. Perhaps the most dense wine along with the 82, prior to 2010. Also the fruit seems darker than the others. Expressive nose displaying crème de cassis, plum, black cherry, licorice, mocha, bitter milk chocolate, cedar, lead pencil, only a hint of green, leather and earth. Excellent concentration, beautifully layered sweet black fruit, medium acidity, medium mineral, nicely integrated tannins and a long licorice and leather driven finish. It is drinking beautifully in a youthful way. Expressive nose displaying intense ripe black fruit, cassis, blackberry, black cherry, licorice, ink and cedar. Excellent concentration, chewy yet silky and precise, intense black fruit driven palate impression, good acidity, nicely integrated tannins and a long finish with licorice and black fruit at the end. Despite the ripe black fruit, it retains good freshness and precision. This will need another two decades to reach the peak. It is not showing much PL green and lead pencil at the moment and I doubt they will emerge with time. Very impressive showing. I am not sure what happened here but the wine seems very lean. Medium expressive nose displaying sweet red fruit, red currant, strawberry jam, cheery, a hint of cedar, bell pepper, lead pencil, spicy, cinnamon and strong limestone. Medium concentration, silky, lean and precise, good acidity, strong mineral presence and a medium to long red fruit driven finish. It is very different than the 14 and the16, i.e. leaner and dominated by red fruit, very Pichon Lalande. After the dinner, Nicolas mentions that it is not a good time to taste the 15 as they are tight and lean. Hopefully it will gain weight with a few more years in bottle. Barrel sample, obviously very primary and a bit grape juice like. Expressive nose displaying intense jammy black fruit, crème de cassis, ink, lavender, licorice, strong lead pencil, a hint of cedar and liquid smoke, bitter chocolate and earth. Impressive concentration, nicely layered with intense perfectly ripe blueberry and blackberry, quite chewy yet silky, sensual and polished, bright acidity, strong mineral presence and an incredibly long intense crème de cassis and licorice driven finish. Despite being the most concentrated wine of the night, it retains excellent freshness and purity. My WOTN.